I live in a 1930s maisonette in East London. It was the area, which I knew well, that attracted me: it’s really friendly, has three lovely parks – and I wanted to be able to walk to work. I stalked the building for two years, putting adverts in the letterboxes in case someone wanted to move. I gutted it when I moved in. It’s small, but I love it. The first time I walked into this room it was late autumn, and the light through the window was wonderful – it is bright all year round. It really lifts my spirits. The living space has evolved a lot – I’m forever moving things around, especially the prints and illustrations; I think the simple lines in the room show them off really well. My taste has definitely changed: I used to have more antiquey pieces, but they didn’t look right in here, and I find that a lot of new ”modern” pieces aren’t very well made. 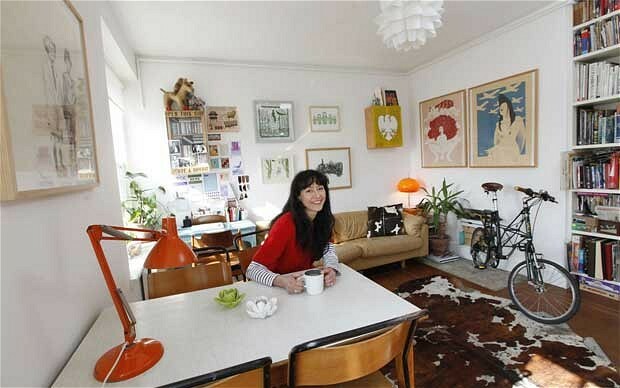 My furniture falls in between: I really admire mid-century Danish design. I don’t like clutter – that sounds bonkers, because to some people this room seems pretty full, but there was order in its design. I love the simplicity of these old chairs. They are the stackable ones that were in every office and school in the Sixties. I got them from a vintage place in Hackney. The chair against the desk is a lovely, curvy Danish design – I had to save up for that one!